The Jorno team, innovative developers of input productivity solutions for touchscreen handheld devices, is thrilled to unleash its creation, the Jorno keyboard. 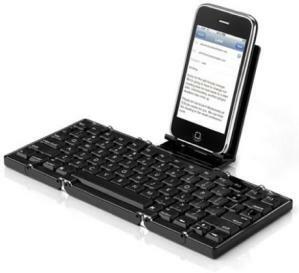 Jorno serves as an on-the-go solution for typing on a variety of mobile devices. This pocketable keyboard is the size of your palm when folded, measuring in at 7.6mm for a clean and modern design. It folds down five ways, unlike any other competitor on the market, and easily fits into your pocket or purse. By transforming your iPhone, iPad, or Android device into a fully functioning laptop, users can enjoy the freedom of easily writing emails, taking notes in class, or working on other assignments from virtually any location. Jorno also comes equipped with a detachable cradle to securely hold your device in landscape or portrait mode for the most practical and productive user experience. The cradle is designed to support phones as well as mini- and full-size tablets. Jorno pairs via Bluetooth to deliver convenient connectivity capabilities, and also guarantees compatibility with a wide array of devices. The Jorno keyboard also has an intelligently rigid design, so it won’t collapse as users are typing on their lap. The built-in rechargeable battery lasts an entire month to deliver maximum usage time without concern for losing power. Jorno has garnered a number of prestigious industry awards, including an Engineering Design and Innovation Award from the Consumer Electronics Show. The revolutionary Jorno is now live on Kickstarter. Additional information can be found at http://www.kickstarter.com/projects/jorno/jorno-the-pocketable-folding-bluetooth-keyboard.